Search the MLS and learn more about us on our website! 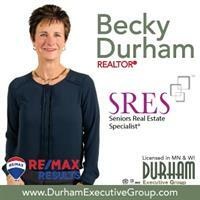 John and Becky Durham are an award-winning husband/wife real estate team licensed in WI and MN. We are unique in that we work together to offer you more time and attention than other, individual agents; the attention you deserve! 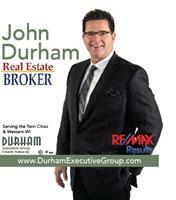 With over 29 combined years of real estate experience, we offer professionalism and commitment to quality of service. - John has a degree in construction, which makes him uniquely qualified to assist you if you want to build a new home or invest in a 'fixer upper'. We serve clients in all price points in the St. Croix River Valley and are licensed in both MN & WI. We love living in Hudson and would love to help you buy and/or sell a home here. Call us today! (651) 231-2191. I-94 Exit Charmichael. South to Stageline Drive. RE/MAX Results offices are on the second floor of the the Citizens Bank building on your right.